Are you a Closed Circuit Rebreather (CCR) diver who is a serious adventure seeker wishing to explore overhead environments? Sign up for the TDI Full Cave Diver Course!This course is the third stage of overhead environment training in the series of TDI’s Rebreather Full Cave Diver Development Program. Advanced rebreather cave dive planning, the practical execution of different types of cave systems and scenarios divers encounter are presented. 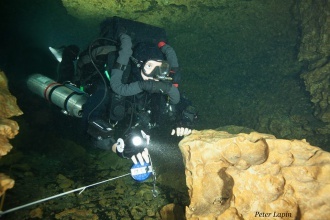 This cave diving course is not intended to prepare divers for evaluating all facets of cave diving. The objective of this course is to expand and critique previous skills accomplished in the TDI Rebreather Cavern and Introductory Cave Diving Programs. Emphasis is placed upon dive planning, bailout range requirements, and skill perfection through actual cave penetration.